Highlander School is dedicated to educational excellence by using a curriculum with high standards and nurturing the purpose and plans of God within each student. For 50 years Highlander’s the academic expectations for students have built a solid foundation for their future academic endeavors, with the belief that if you ask for excellence, students will rise to the challenge. At the core of our academic curriculum is the Carden curriculum, which is a strong phonetic approach to reading and spelling, while using analytical thinking tools to better understand the written word for reading comprehension. Miss Carden’s philosophy and teachings stress mastery in content and develop problem solving skills through a structured, stimulating, and sequential academic curriculum. Highlander’s elementary classrooms are designed to develop and encourage analytical and organized thinking through a structured and challenging academic curriculum. Continuity from grade to grade allows teachers to create a life-long passion for learning and instill self-confidence, creativity, and communication skills. Christian values are the pillars of our academic foundation that strengthen the character of Highlander students. 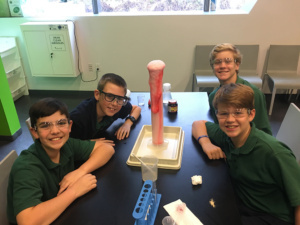 Highlander’s required elementary academic program includes art, music, French, physical education, and computer applications, as well as the core subjects of language arts, math, science, and social studies. A focus on organizational skills, study skills, and social skills prepares students for their next level of education. Saxon Math, the basic math program utilized at Highlander, is a program that is focused on student success. The unique structure of Saxon’s mathematics instruction promotes student success through the sound educational practices of incremental development and continual review. Lessons on a topic are not collected into chapters to be presented in a few weeks and then dropped. Instead, lessons on a topic are spread out over time, allowing students to solidify the learning on one building block of a concept before moving on to the next block of the concept. Assignments are not composed of problems of the same type to be completed almost automatically. Instead, assignments contain a variety of previously presented concepts, providing distributed practice that boosts long-term learning and concept acquisition. Hands-On Equations is a hands-on, concrete approach to algebraic linear equation that is used in Highlander’s sixth grade math program. It is a system that does not require any algebraic prerequisites. It gives students a strong foundation for later algebraic studies. Elementary school students are fascinated with Hands-On Equations. They are impressed with their ability to solve algebraic linear equations in a game-like manner. The “legal moves” provide students with a sound, intuitive understanding of fundamental algebraic properties.